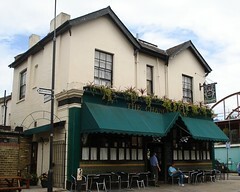 A friendly and old-fashioned pub in Hammersmith, opposite Riverside Studios. This is a charming pub, well-kept and well-run, but showing no signs of following any of the more unfortunate recent trends or fashions, especially given its proximity to a large arts centre. Inside there's carpet on the floor, wooden beams, old photos of actors on the walls, and a surprisingly upbeat selection of pop music. There's a beer garden area out the side with an awning to keep off the rain. The toilets have handtowels out, rather than dryers. On the bar, two handpulls have Courage Best (£2.80/pint) and Spitfire. There's also the range of usual lagers. There's no menu as such, but they do serve a selection of toasted sandwiches (£2.30) -- covering such options as cheese and ham, cheese and onion or tomato, and stilton cheese. These are served with a little bit of salad and some nacho crisps, but are pleasingly simple, and tasty. Last visited by Ewan and friends, 13 November 2008. Last edited 2011-06-26 14:12:10 (version 5; diff). List all versions. Page last edited 2011-06-26 14:12:10 (version 5).